Happy December! It's hard to believe Christmas is right around the corner. I'm feverishly working on my holiday cards, and a few gifts I've been commissioned to create, I hope to have the finished an off my desk by weeks end. They're calling for snow here later this week, I still can't believe we haven't had any yet this season. I know my husband, boys and even the dog are anxiously awaiting that first measurable snow so the can go riding! 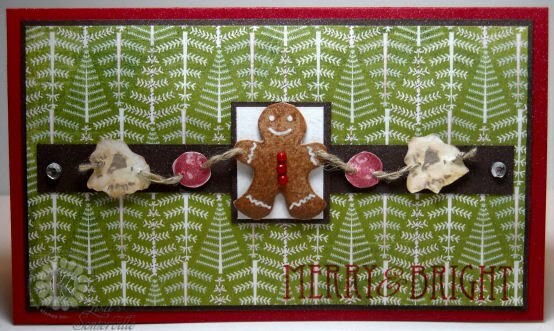 To get you in the holiday mood, I've got a nice sparkly card to share with you today. I used the Multi Step Build a Garland and Multi Step Christmas Lights from Kitchen Sink Stamps. I took some creative liberties with MJ's TSSC98 and used that as the inspiration for my layout. I thought the string of Garland was perfect for her layout. 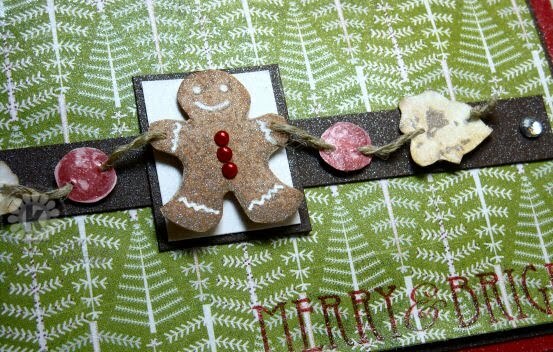 So the gingerbread man wouldn't get lost on the card, I used the Out of the Box Technique to draw attention to him. I added his icing lines with a White Gel Pen, and gave him some red bling using Kaiser pearls. The sentiment from the Multi Step Christmas Lights was stamped in Red and clear embossed on the Basic Grey paper. Once the card was completely assemble, I added a light misting of Pearl Glimmer Mist - up close it looks like the card was sprinkled with sugar! Don't forget, today's the last day to save 20% on all purchases from Kitchen Sink Stamps - simply enter code LISA15KSS at checkout. The gingerbread was stamped on Caramel card stock as follows: #3 Memento Rich Cocoa, #2 Memento Potters Clay, #1 Memento Desert Sand. Add White lines with Gel Pen and buttons with Kaiser Pearls. Stamp the Berries as follows on White: #1 Memento Rhubarb stamp off, #2-3 Memento Rhubarb. The Pop Corn as follows on White: #4 Stampin' Up! Close to Cocoa, #3 So Saffron, #2 Apricot Appeal, stamp off repeat, #1 Barely Banana, stamp off and repeat, #1 Adirondack Snow Cap (heat set). Be sure to stop back tomorrow, as I'll be sharing some Last Minute Gift Ideas for the JustRite DT Blog Hop! Lisa--this is so cute! Now you've given me an idea for my next class at LifeLinks! It's a cutie, great colors! So so adorable! Love this! I love this card you did a great job. Again I am so far behind, this is the first chance I had to check out the players in this week's sketch challenge. Your cards is adorable. No, I can not believe how close Christmas is, it is nuts! Thanks so much for playing along every week! You rock!